Fair Work Week (Senate Bill 828) passed through Oregon’s Senate on June 22 with bipartisan support (the final vote was 23-6 in favor) and is moving on to the House! Senate Bill 828 is a historic bill, one which makes Oregon the first state in the country to require fair scheduling for working people. Click here to learn more about this important step forward. 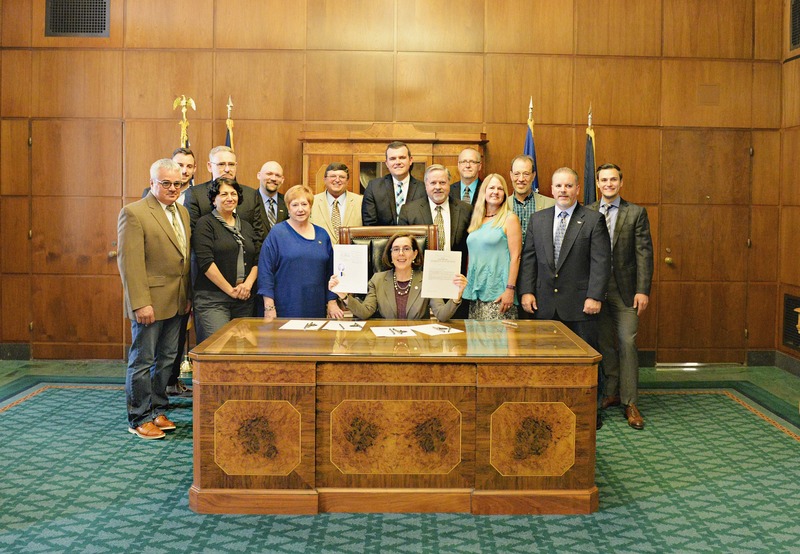 On Friday, June 23 Governor Kate Brown signed the Rural Worker Protection Act (Senate Bill 1040), a groundbreaking law which protects the freedom of working people to stand together from anti-union attacks at the local level. Click here to read more about why this law comes at a critical time for the labor movement. 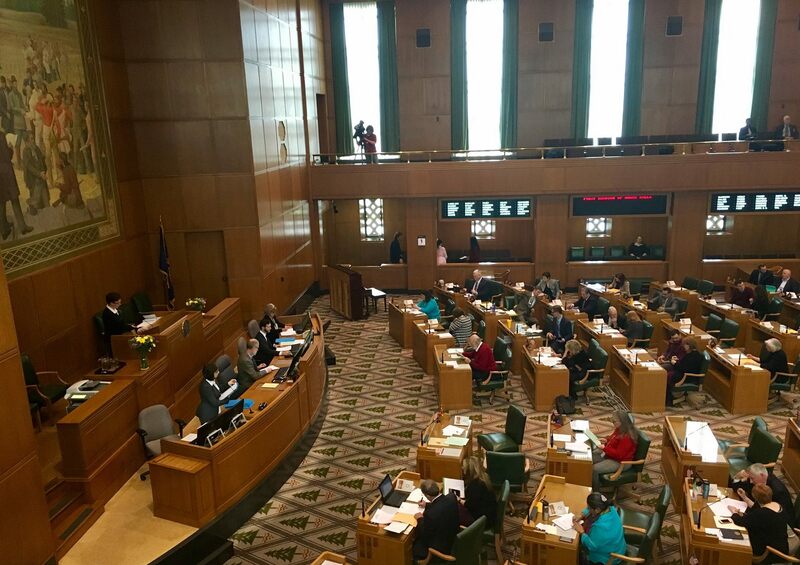 On Monday, June 26 House Bill 3170, which will give a voice to Oregon’s public university research faculty who currently lack the ability to join a union, passed the Senate with a 17-13 final vote. After a concurrence vote in the House, the bill will move to Governor Kate Brown’s desk for her signature. Click here to read more about this important bill. Despite these wins, we still have work to do in Salem. Workers and our economy still need a robust, multimodal transportation funding package from this legislature. And while we remain hopeful about the transportation conversations, working people are disappointed that lawmakers abandoned an effort to restructure our tax system and ensure that working Oregonians have access to the vital services we all depend on. 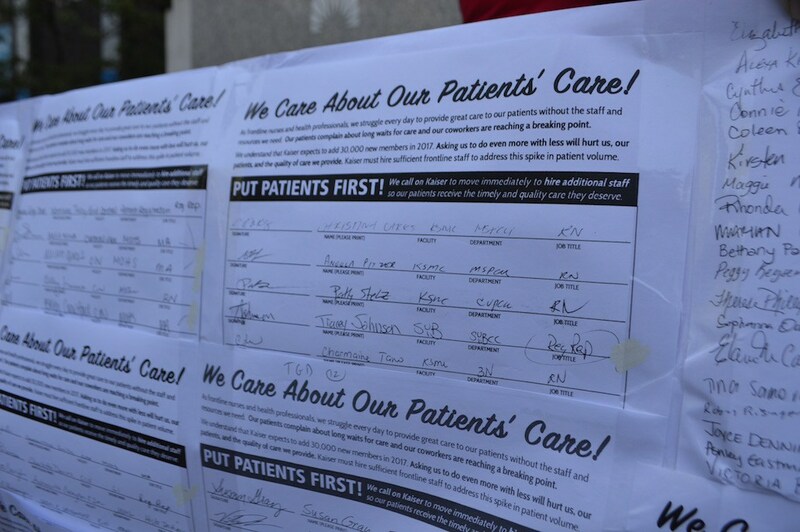 Click here to read more about the campaign for safe staffing at Kaiser. The Republican Senate members have laid another egg in their attempt to "repeal and end Obamacare." As with the House Republican bill, polling data shows the majority of Americans reject the Senate version. The elephant in the room is what makes the whole exercise stink. That elephant is the unwavering faith in the private marketplace to decide who gets what in our society. Americans sense something is fundamentally wrong but search for words to express this problem. The Tea Party Republicans objected to the Affordable Care Act as an unwarranted expansion of government. Honestly, they were not concerned with addressing the problem of the large and growing stress on American households to access health care without going bankrupt. In their tiny-minded world, lack of anything, from housing to education to health care, is a matter of personal priorities and market choices. Therefore, if people do not have health insurance, it is because they do not want to buy it. Trying to negotiate with that extreme view, then-President Barack Obama struck a compromise position on health care, invoking a public interest in health and declaring health insurance a personal responsibility. The ACA strikes the middle ground in softening the Tea Party's approach to caring about the high cost of health insurance and, therefore, has the government either buying insurance for those with very low incomes (by extending eligibility for Medicaid) or subsidizing those of modest incomes in meeting their "personal responsibility." The initial revolt against the ACA was against the government creation of a new personal mandate, which to the Tea Party was an intrusion to force people to buy something they did not view as a high enough priority to forgo other wants like housing or education. Moreover, while the exchanges were a private marketplace, the Tea Party objected to taxes subsidizing people buying health insurance. What stinks in all this is that access to health care really does not belong in the marketplace. Too much of health fits into the normal space of a public good. In fact, the portion of health care that belonged in the public good space made the ACA such an ugly compromise, angering both the right and the left, by making it an individual mandate to buy health insurance. A public good has several characteristics. One common problem is the free rider problem, resulting from providing a good where it is difficult to exclude usage. Examples include clean air and proper functioning roads. If you live in a nation with people who are healthy because of proper infrastructure investments like proper sanitation, then certain diseases are not going to be very common, like cholera. But how would you exclude someone from the sanitation system? Second, when the externalities of a good are positive, then people will tend to under consume them because people other than the purchaser will benefit. Living in a society of well-educated people helps democracies function and makes it easier to start a business needing highly trained or trainable workers for instance. But because education can be personally expensive, left as a private good, many people would not get enough education to help economic growth or support democratic institutions. Health is similar. If people get their children inoculated against childhood diseases like measles and whooping cough, the diseases become less prevalent and your children will be less likely to get them. Third, some goods are rights. You have the right to life, which means personal safety, so we accept police as a public good. Many people think that the right to life also means access to health care, the ultimate in the necessity of a right to life. All modern advanced industrialized economies, except the United States, assume health care is a publicly provided human right. When something is a private good, and we leave it to the market to allocate, then price is the signaling device and the rationing mechanism. The price of a good, as a popular automobile, sends a signal to automakers which type of cars to build. In addition, the price rations who will get the automobile and who will not. If your income is too low, or if you do not care that much about the specifics of any particular automobile, you will not buy a high-priced popular car. In health, this can have the two drawbacks mentioned. Some people will not contribute, because they will get some of the benefits of living in a healthier advanced economy, even if they do not themselves spend their own money to get healthy. Further, some people will not buy enough health insurance, leaving it to others to support our health infrastructure. Imagine how we could have adequate emergency room space if no one had health insurance and, instead, assumed that hospitals would exist and be properly staffed when people needed an emergency room if they had an appendicitis. Worse, some people will be priced out of the market. Health insurance will be too expensive, and their health will likely suffer from it. The results are death by poverty. These results are not equivalent to Janis Joplin’s prayer for the Lord to buy her a Mercedes-Benz. The United States relies, more than other advanced economies, on private, market-based provisions of major human capital investments like education and health and personal investments like housing. The result is that a higher share of U.S. GDP (gross domestic product, the value of all the new goods and services in a country) is consumption (items bought by private households). In a middle-income nation, such as the United States through 1986, where the majority of income is earned by the middle 60% of the population, this has a lot of virtues. One of which is that providers aim to please this income group because they are the majority of the economy (in a market-based system where price is the rationing tool, it is "one dollar one vote," hence the majority of the economy is where the majority of the income lies). And, it means that the rise in prices will follow the income growth of the economic majority, assuring they can continue to be customers. However, today, the majority of income is with the top 20% of income earners, and in a few short years will be the top 10% of earners. That means prices and goods and services today tilt to the top 20% and will soon follow the incomes of the top 10%. Think about why it is never difficult for middle-aged men to buy their little blue pill, but sometimes your doctor may run out of flu shots. From 2000-2009, the share of Americans getting private health insurance through their employer declined from 63.9% to 55.8%. Employer-based private health insurance had provided the bedrock of the American health care system. Medicaid was introduced in 1965 to fill the void for low-wage workers whose employers tended not to provide health insurance. This is the typical U.S. policy response when price rations portions of people out of the market. From 1965-1986, while America was a middle-income nation, the average wage of production and non-supervisory workers increased by a factor of 3.6, while health care costs increased by factor of 4.3. But, from 1986-2008, health care costs increased by a factor of 3.3 while the average wage went up by only a factor of 2.2. Health care costs were rising much faster than wages for the middle class. The increase in health care more resembled the increase in income for the top 20%, the economic majority. As a result, not just the poor, but middle-class workers were being priced out of health care, too. The ACA solution was an extension of subsidies to those who cannot afford a necessity. The flaw was that insurance is cheapest when it is universal, including both high- and low-risk individuals in the pool to share broadly in the risks. This is why Social Security is so effective in covering workers’ families against premature death, an onset of a disability or living into old age. It is why Medicare works as health insurance for the elderly, some of whom are very healthy and some who are critically ill. Creating an adequate market for something that is a public good proved too difficult, especially in those states with Republican governors who refused to extend public health coverage by expanding Medicaid and balked at promoting the private health insurance marketplace. While Republicans claimed it was the private market exchanges that failed, nothing in their proposed legislation addressed fixing those market places. Clearly, this was a cynical manipulation. In the first place, Republicans objected to the rules that standardized health insurance policies, providing the information to make market-based comparisons in buying health insurance. A market cannot function efficiently if consumers do not have the information to compare products. Consequently, Republicans insistence on destroying that market information will make the problems of the exchanges worse. Second, shrinking the public health coverage that Medicaid expansion provided will make the insurance markets less efficient because fewer healthy people will be able to afford health insurance, leaving more people with poor health or pre-existing health issues seeking private health insurance. This will make pricing in the exchanges uncertain, but certainly higher for people who do not have employer-provided health insurance—a group that is growing. Republicans proved there is no market-based solution to fixing the ACA. It already was a damaged proposition precisely because it sought a market-based solution to something that was inherently a public good. Since the Republicans did not address the shortcomings of the ACA, one can only conclude the intention was a giant tax cut for wealthy Americans. Further, in a nation where income inequality is at a crisis level, exacerbating income inequality by piling even more money on the entitled rich will hurt economic growth, a point well documented by the Organization for Economic Cooperation and Development and the International Monetary Fund. The only solution to fix the shortcomings of the ACA is a public good approach. The most efficient way to do health insurance is not through an analogy to state-based automobile insurance mandates because, ultimately, automobiles are a private good and people can opt out of owning a car. Instead, health insurance is like Social Security. Because becoming unhealthy is a universal risk, and because people having health insurance provides so many public benefits, it is best provided as a public good like Social Security and Medicare. The only issue for debate is what form the public good should be funded and care allocated. The ACA slowed health care cost escalation; in no small part by redefining the market for health care away from the top 20% of income toward the middle. By expanding the demand, the price point in delivery shifted. Making health care a true public good would help the United States achieve the lower per capita health expenditures of other advanced economies who treat health as a public good. The stinking elephant in the room is an undying faith in the private marketplace. This will continue to be an ever-growing problem. When 10% of the people hold half the income in the nation, those 10% will be consuming more than half of everything produced in the United States. That does not matter that much if they are buying half the Cadillacs, but it does matter when it is half the health care, half the housing and half the education. A nation so lopsided is one that will not, and cannot, develop. Just look at the problems to be solved in Mexico and Turkey, the nations we are approaching.